Native American settlements in Torrington at that time. This purchase cleared the title to lands previously claimed by Hartford and Windsor and in 1732 the Colony of Connecticut finalized the transaction by granting to Windsor several towns including Torrington. At the same time the General Assembly authorized Windsor to subdivide Torrington’s 20,924 acres among 136 of Windsor’s taxpayers. Ebenezer Lyman Jr. of Durham purchased land from one of the Windsor proprietors and in 1735 became Torrington’s first settler. settled was the eastern hill known as Torringford. These hills provided the best agricultural land for the settler’s agrarian lifestyle. Torrington was given permission to organize a town government and an Ecclesiastical Society in October 1740. One year later, the first church was organized and was referred to for some time as the Church of Christ in Torrington. Before the first meeting house was erected in 1746, services were held in the homes of the settlers. One of the first priorities was the need for protection. In October 1744, the settlers voted to build a fort near Ebenezer Lyman’s place on the west side of what is now Klug Hill Road. It was built to protect the people from attacks by the Indians from the north and west but in fact was probably more reassuring than useful. The fort, which was 75’ x 100’ was built of chestnut logs split in half and stood about eight feet high. The alarm usually was given by lighting signal fires on the hills from Albany eastward. In 1752, a committee voted to lay a highway from north to south through the center of town. This was to become Main Street. Another road was laid out along the west branch of the Naugatuck River until it met with Main Street and was called Water Street. These two roads were intersected by the old road coming down from the eastern hills. 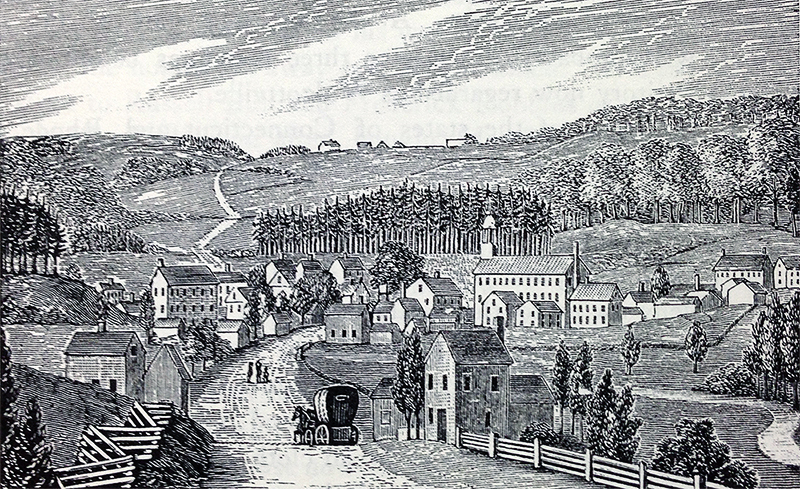 In 1801 this thoroughfare was chartered as the Litchfield Turnpike, a toll road between West Simsbury and Litchfield. The road followed what is now East Main Street and crossed the river at Center Bridge. The old north south highway was later chartered as the Waterbury Turnpike and it intersected the Litchfield Turnpike at center bridge. The junction of these roads triggered commercial development in this area which would later be known as Wolcottville and is now the central business district or downtown Torrington.